The Lobby also monitors what professors write and teach. In September 2002, Martin Kramer and Daniel Pipes, two passionately pro-Israel neo-conservatives, established a website (Campus Watch) that posted dossiers on suspect academics and encouraged students to report remarks or behaviour that might be considered hostile to Israel. A brief version of the Mearsheimer and Walt study appeared in the London Review of Books, so I replied to them in a letter to the editor of that publication on March 16, 2006, taking issue with the above quotation. This account is inaccurate in several ways (e.g. Martin Kramer had no role in founding Campus Watch), but I write specifically to state that no 'Lobby' told me to start Campus Watch. Neither the Middle East Forum nor myself has ever taken orders from some mythical 'Lobby', and specifically I decided to establish Campus Watch on my own, without direction from any outside source. I challenge Mearsheimer and Walt to provide their information that connects this 'Lobby' to my decision to establish Campus Watch. 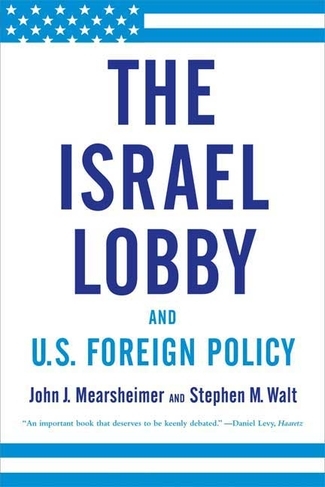 the Israel lobby is not a secret, clandestine cabal; on the contrary, it is openly engaged in interest-group politics and there is nothing conspiratorial or illicit about its behaviour. Thus, we can easily believe that Daniel Pipes has never 'taken orders' from the lobby, because the Leninist caricature of the lobby depicted in his letter is one that we clearly dismissed. Readers will also note that Pipes does not deny that his organisation, Campus Watch, was created in order to monitor what academics say, write and teach, so as to discourage them from engaging in open discourse about the Middle East. Three responses. First, Mearsheimer and Walt unconditionally concede they have no information about the alleged "lobby" giving me orders concerning Campus Watch, confirming the falsehood of their initial claim. Second, what they dismiss as a "Leninist caricature" of a lobby – one that strategizes and gives orders – is the only type of lobby that exists. If no one instructed me to begin Campus Watch, how could Campus Watch's coming into existence be part of an organized campaign? Third, my previous note strove for brevity, so I did not contest Mearsheimer and Walt's inaccuracy about the goal of Campus Watch. I shall do so now: I deny their point that Campus Watch intends to discourage academics "from engaging in open discourse about the Middle East." As the mission statement at www.Campus-Watch.org explains, the project "reviews and critiques Middle East studies in North America with an aim to improving them." Campus Watch is to Middle East studies as political analysis to politics, film criticism to movies, and consumer reports to manufacturing; we provide assessments for the public. Unlike politicians, actors, and business executives, who accept criticism with good grace, academics howl with umbrage at being judged. Comment: My small role in Mearsheimer and Walt's massive account symbolizes the sloppiness of their account and discredits their conspiracy-theory vision of efforts to build a strong U.S.-Israel bond. June 8, 2006 update: The London Review of Books today published an edited version of the second letter quoted above. The lobby also monitors what professors write and teach. In September 2002, for example, Daniel Pipes, a passionately pro-Israel neo-conservative, established a website (Campus Watch) that posted dossiers on suspect academics and encouraged students to report remarks or behaviour that might be considered hostile to Israel. Comment: (1) This is the third iteration and it still has lots of basics wrong - starting with the fact that Campus Watch is not primarily focused on Israel but covers the gamut of Middle Eastern topics, and going on to Campus Watch not being limited to a website but a full-blown project with activities unrelated to the Internet. (2) I can't wait to see how the second edition of their book continues to make errors, but this time with a fourth wording. Sep. 9, 2007 update: For my reasons to stay away from this book - other than correcting the record about myself - see "Learning from the Mearsheimer-Walt Fiasco." I've been criticized often, but nobody has ever accused me of sloppy scholarship. Do you think [publishers] Farrar, Straus and Giroux, as a serious publishing house, would allow us to do sloppy scholarship? It flies in the face of common sense. There are 106 pages of endnotes, and Steve and I paid two fact-checkers $16,000 out of our own pockets to check our facts. As for the content of all those footnotes, Martin Kramer pursued one solitary note that caught his eye and - sure enough - it turns out to be wrong. Not $16,000 well spent, it would appear. Of course, a number of these hard-core neoconservatives may indeed have accepted financial or other favors from Zionist sources and thereby qualify for specific inclusion in the lobby. But which ones? And what and how much? Mearsheimer and Walt do not say. In the absence of any such evidence, it would be far more accurate to describe these and similar individuals as fellow-travelers of the lobby, not as card-carrying members. Sullivan also mentions the Middle East Forum in a parallel list of institutions, then asks the same questions of "what and how much"? He was an early supporter of Campus Watch (the organization Daniel Pipes founded to blacklist scholars it disapproved of). Campus Watch was founded to provide a platform for critiquing the highly politicized field of Middle East studies, not to "blacklist scholars it disapproved of." In making this baseless claim, Walt repeats a tired canard and reflects the provincialism of many CW critics, who see themselves as exempt from the type of criticism expected by more seasoned professionals such as lawyers, physicians, politicians, businessmen, and others. Criticism isn't blacklisting, and CW could hardly "blacklist" anyone; with what power would we enforce it? Myers, who heads Campus Watch, looks back on Walt's four-year long history of errors and plaintively asks, "When will Walt get CW right? When will the Loch Ness Monster be caught? The Cubs win the World Series?" Related Topics: Academia, Arab-Israeli debate in the U.S., Conspiracy theories, Middle East studies | Daniel Pipes receive the latest by email: subscribe to the free mef mailing list This text may be reposted or forwarded so long as it is presented as an integral whole with complete and accurate information provided about its author, date, place of publication, and original URL.